Early last summer I purchased a pair of Off Road crocs, and they have rarely left my feet. They are quite possibly the most comfortable casual shoes I have ever owned. I always wear them to the golf course, and am anxious to slip them back on after walking 18 holes. 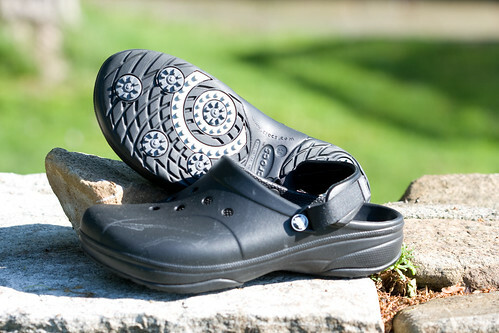 When Crocs purchased Bite Shoes last year, my first thought was wow…when do I get golf spikes on my crocs?. Well, I did not have to wait long. Crocs quickly put together a golf shoe design, that is more than just spikes slapped onto the bottom of a traditional croc: the Crocs Ace. As you can tell from the pictures, at first glance, the Ace shoes look quite similar to the original Crocs. Upon closer inspection, you’ll first notice that there are no holes on the sides of the shoe. This prevents water or dew from seeping into your shoes during early morning or soggy rounds. Obviously they are not waterproof, but if you played with normal crocs, plenty of water would quickly get in there. Flip the shoe over, and you’re presented with the other obvious change…soft spikes! The Ace shoes use Champion spikes which appear to be less grabby than typical scorpion or spider type soft spikes. However, I found them, in combination with the other nubs and creases, to provide ample traction on the course. With the rear strap of the shoe snug around your ankle, the shoes do feel quite solid on your feet. Feel…yeah, these are crocs and they feel absolutely amazing. Your feet really do mold into the foot bed. If you haven’t worn crocs, it is difficult to explain. But wear these for 18 holes and your feet will still feel quite fresh. For walking, I haven’t worn any more comfortable shoes. Now, we discussed water and comfort. No question these shoes are comfortable…once they are broken in. I was so excited to play a round when I first got these, I ran out to the course, slapped them on with no sock, and headed for the starter’s shed. Talked with the starter for a minute, he looked at my shoes, and asked if I planned on playing in plain old crocs…I showed him the sole, and he looked shocked. I trotted off to the first tee with a big grin on my face…oh how comfortable these shoes felt! Well, about 6 holes into my round, I had walked through several puddles (the course was quite wet)…had brand new croc rubbing across the tops of my feet…and ouch. I had a couple huge blisters on the top of both feet. The combination of newness, water, and the stress of your skin sticking to the top of the shoe while your swing causes some big problems. I ended up having to stop after 9 holes as it just became too painful to walk. My own stupid mistake for rushing out there not thinking about the ramifications. I wear my normal crocs without socks all the time…why would this be a problem? Well, I would suggest wearing socks with them the first few times you play, or at least wear them around your house, your back yard…take your dog for a few walks…before you take them out on the course. 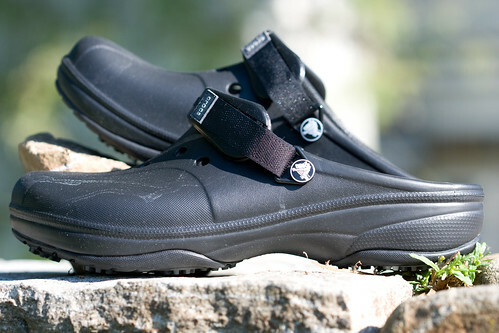 One of my initial concerns when I thought of Crocs making a golf shoe would be whether or not they could make a croc with enough lateral stability to support a golf swing. 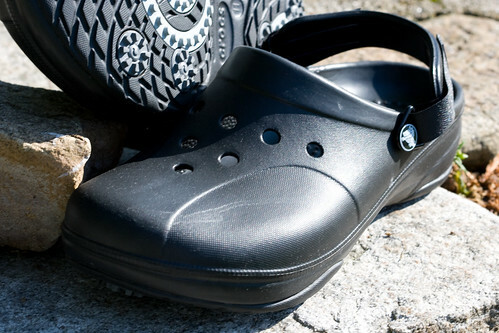 If you pickup a pair of these shoes, you’ll notice the top of the shoe is a little more rigid than a typical croc. 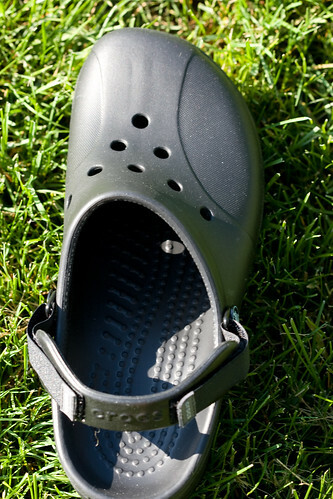 This seems to make the shoe more stable than trying to hit balls wearing a normal croc. If you roll your feet ala Jack, you’ll feel quite comfortable. The shoes accommodate this quite nicely. The only problem I found was with my forward foot, it had a tendency to twist within the shoe rather than the shoe spinning out on shots where I have lost my balance or not shifted my weight properly. Otherwise, the shoes felt quite supportive and had a good amount of traction on a variety of lies. Side hill lies on wet grass, bunker shots or just walking on the green, these shoes felt quite supportive. While you may get some strange looks, and it takes a bit to break them in, the Crocs Ace Golf Shoes are quite possibly the most comfortable golf shoes I have ever worn. 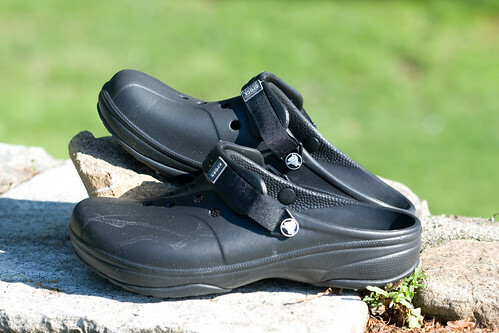 On wet days you will probably want to stick with your normal golf shoes, but on those dry, hot summer days, when your feet would normally feel like they would melt after walking 18…the Crocs Aces are a godsend. Given that they can be had for under $40, these shoes are quite a bargain. If nothing else, I’d pickup a pair just to throw in your trunk to have for those quick 9 hole rounds after work. I’m sold, I love Crocs! Great review! I love my crocs. I hadn’t realized that they were making golf shoes and may have to give these ones a shot. Thanks! Any idea if the spikes are replaceable? If so, what brand/style?